This book has been recently re-released, along with its companion volume The Strange Birth of Colonial Democracy as a new book called Freedom on the Fatal Shore. In the foreword to the new version, Hirst writes of his affront at the wealth of publicity that Robert Hughes’ book The Fatal Shore attracted, compared with the muted attention that his own book had received. Yet although Hughes agreed with many of Hirst’s arguments about the normality of the system, the overwhelming “takeaway” from Hughes’ book was that the Convict System was a cruel, dehumanizing, oppressive system. Although Hughes admitted that the secondary punishment system he describes was not the norm, it is his depictions of the lash and the triangle that a reader remembers. Hirst argues instead that, right from the beginning- even at the planning stages of the First Fleet- there was an intention for something other than a harsh, punitive penal society. Women and children were included on the First Fleet, complicating from the start the creation of a strict penal system; convicts were encouraged to marry; there was an unfulfilled intention to pick up more women from the islands on the way (and what a what-if scenario that gives rise to!) . The overall concern of the British authorities was that they not return to England; hence they were given grants of land and known as ‘settlers’ once their sentences had expired. Because it was intended that they become part of a British capitalist economy, they had more legal rights than they could have had in England- the right to sue, the right to give witness in court- and there was no bar on their economic activities once freedom was attained. The early food shortages amplified the imperative that an agricultural sector be developed as quickly as possible. When convicts were turned over to private landholders they were called ‘assigned servants’; they refused to work all day and insisted on “own time” after their tasks were completed; they often lived in huts separate from the owner’s house compared to the suffocating oversight of servant life in England; even flogging was controlled by law. So who were the “enemies” in Hirst’s title? The “exclusives” spring immediately to mind: emigrants with capital who came to the colony and resented the wealth and social acceptance of the ex-convicts who surrounded them. But Hirst complicates this simplistic explanation. First there were the Benthamites back in England, whose own commercial proposals for the Panoptican-style penitentiary were thwarted by the settler-model penal scheme that underpinned the First Fleet. They had a vested interest in promoting their own model, and had increasing influence from the 1820s on in making the system more uniform. Then there were the liberals and humanitarians themselves (not necessarily the same thing), particularly in England, who decried the dehumanizing effect of convictism and its parallels with slavery. Ironically, in their efforts to overturn transportation, they themselves had to demonize the system by highlighting its inequality, cruelty and degradation. It was also a rather tenuous line to tread, because in many ways British labourers during the Industrial Revolution had more difficult lives than transported convicts in the colonies. Third, by the turn of the century there was an increasing group of native-born white Australian who, unlike both exclusive emigrants and convicts, were born in the colony. They were shaping up as a fine generation: good food and the beneficiaries of an emphasis on education that far outstripped that in Britain. They grouped together both emigrants and ex-convicts as British, not Australian like themselves. It was the mooted re-introduction of transportation that galvanized these groups into action. The supporters of transportation- the wealthy squatters with large pastoral properties- wanted to portray the benefits and normalcy of the convict system. The opponents of transportation- many of whom were free emigrants who wanted to protect their high wages and respectability- needed to develop a narrative of convict society that highlighted its aberrant features and suppressed its successes. They needed to distance themselves from the convict past. In agitating against the revival of transportation, the blurred edges and compromises of the system had to be downplayed and convict society had to be framed as a de-humanizing system, steeped in cruelty and violence. The irony is, Hirst argues, that even today our understanding of convict society is based on the assumptions of its enemies. This is a punchy book. Its footnotes are utilitarian: there is no alternative narrative being played out in the notes at the back of the book. Its argument is made upfront, and pursued relentlessly throughout the body of the work. 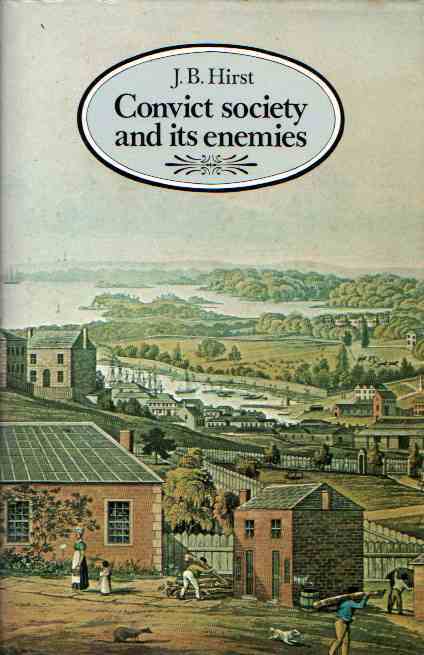 From a structural sense, there are two fairly short opening chapters, then a long third chapter that examines convict society in terms of the economy, the law, rebellion, status and the politics of dependence. The book closes with a short but succinct conclusion. It’s also fairly pugnacious book, determined to convince, and it does not take a backward step at all. This becomes rather strained in the section on flogging, which is written carefully but insistently. It is unashamedly a book of the head rather than the heart. At times this can be rather exhausting, but in its sheer doggedness it raises some interesting questions. 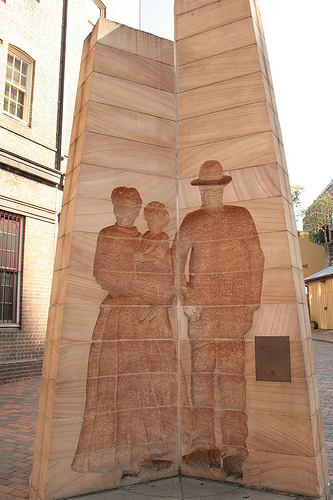 For example, Hirst notes the convict sculpture at The Rocks in Sydney. His decision to persevere with the illustration and to caption it in this way makes me pause. He has done the right thing in acknowledging the plaque on the sculpture, and thereby undercutting its usefulness to him as an argument. The plaque has done the right thing in pointing out its artistic licence in depicting the unusual. However, I’m not sure whether the plaque was there from the start, whether it was itself part of the artist Bud Dumas’ creation, or whether it was added later perhaps even in response to Hirst’s criticism. It is the chains that mark out the “Convict” from the man in the “Immigrant Family” sculpture above. 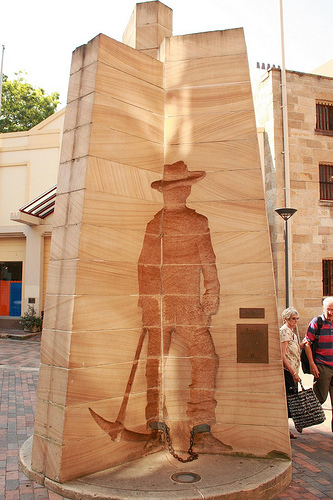 In this sculpture, the immigrant man stands with his family, but he was just as likely to wield a mattock in a sunhat when he was at work. But when we take the chains away from the convict, what are we left with visually? Just men. And that’s the conundrum. A very interesting post. I continue to enjoy your writing!